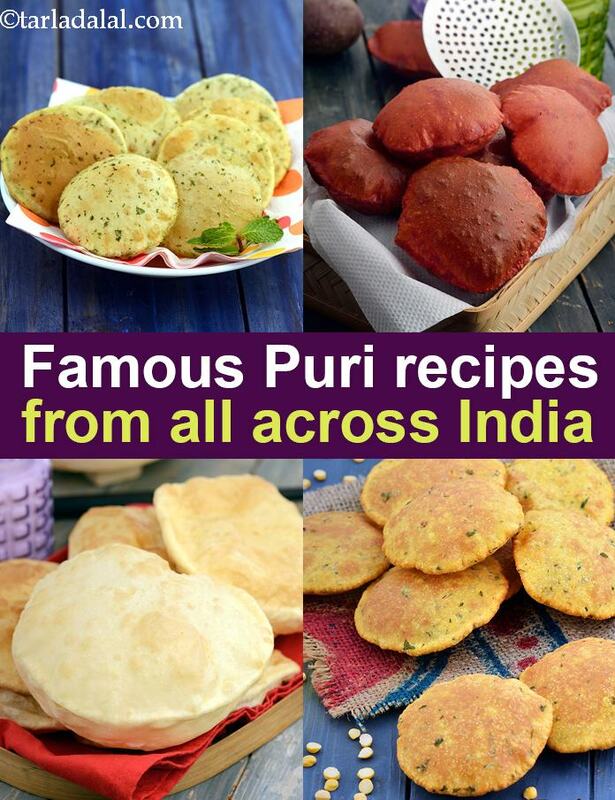 Puri Recipes, Famous Puris from all across India. Puris are popular in all parts of India. Puri with Aloo or Shrikand in the West, Puri with Potato Masala in the South, Puri with Palak in the East and Puri with Chole, Punjabi Aloo Puri or Sooji Halwa in the North are some of the evergreen combos that one never tires of having! If you are a puri lover, you will feel at home in any Indian restaurant anywhere in the world. The puri needs no introduction to any Indian. It is perhaps one of the most versatile and popular of Indian foods, well-known and much-liked not just in all states of India but in other parts of the world as well. Whether it is a rich and spongy batura or a light and crispy whole wheat flour puri, be it a plain one or a spicy version, everybody loves puris! The puri is basically a deep-fried snack made with dough. The dough is made of flour, water and salt, sometimes perked up with a few spices or pureed veggies or greens. This dough is then shaped into small discs using a rolling pin and deep-fried. There are many varieties of puris such as plain ones, stuffed ones, and crispy jar snack puris that last for a week. What is a plain puri? A plain puri is essentially one that has not been stuffed. It is made of flour-based dough, seasoned with salt and/or spices. Sometimes the dough is reinforced with grated or mashed veggies, pureed greens, etc. Since these discs are not stuffed, they puff up enticingly when deep-fried. This gives them a nice and fluffy mouth-feel. To ensure that the puris puff up well and give the right texture, you should make sure the oil is really hot before dropping the flour discs into it. Plain puris can be had for breakfast, lunch or dinner. If you have added a touch of spices to the dough, then you can serve it plain, or with curds and pickles, else serve it with a semi-dry subzi. First comes the basic puri recipe which is cooked all over India. Then the potato based aloo puri recipe. Then comes the famous Gujarati masala puri recipe which goes really well with kids and can be had as an evening snack. If you like vegetable based puris, try the beetrrot puri and spinach puri. Luchi Puri is a famous Bengali puri. 1. The dough should always be semi-stiff and never soft. 2. You must roll the puris without using any flour for rolling. 3. Grease the rolling board and pin with a little oil to make the job easier. 4. The oil should be nice and hot before you drop the puris in. 5. When you deep-fry, press each puri lightly so it will puff up. What is a stuffed puri? A stuffed puri, as the name suggests, is one that has been stuffed with veggies, greens, spices, dal or other scrumptious fillings. You can have these stuffed puris independently, or with a cup of curds. As they are bursting with flavor, you do not need a subzi to add flavor to the meal. Since these puris are stuffed, they do not puff up like regular puris. Unlike the light and crisp mouth-feel of plain puris, these have a more sumptuous, succulent mouth-feel – it kind of feels richer! Stuffed puris give a lot of room for innovation too, as you can mix and match the ingredients to make a different version every time! Khamiri green peas puri is a Rajashtani puri which is actually a snack by itself stuffed with green peas and deep fried. Bhedawi Puri, another Rajasthani Puri offers a unique dining experience of nigella flavoured puris stuffed with a masaledar urad dal mixture. Khus-khus or poppy seeds are used in nearly all cuisines in India. Here is a delicious Mughlai Khus Khus puri stuffed with a poppy seed mixture and made spicy with the use of Kashmiri red chillies. For Jains, we have spicy urad dal puris and stuffed cauliflower puris. What is a jar snack puri? Love puris and want to have them more often? Go for these jar snack puris! These are puris that have been made crispy and can be preserved for at least 10-15 days if stored in a dry and airtight container after cooling completely. A touch of spices like chilli powder, sesame, nigella or cumin seeds may be added to the dough to give the puris an appetizing flavor and aroma. You can enjoy these jar snack puris plain, with tea or coffee. You can even have it for breakfast along with a smoothie, or enjoy it as an evening snack. These crunchy puris can be carried to work or school in an airtight dabba. You can also crush the puris, top them with chutneys and other ingredients like sev to make a chaat-like snack. Make sure you stock up on some of these puris during festivals like Diwali, so that you can offer your guests a zesty snack along with garma garam tea or coffee. The baked methi whole wheat puri is a super healthy snack made from whole wheat flour and masala, which is then baked in an oven. A traditional Indian jar snack, these crisp Methi Puri Recipe are made with a dough of whole wheat flour, spruced up with fenugreek leaves and spices. Whenever you are planning the menu for a party or a festive meal, do not forget to include puri in it, because puris are loved by all. It is a dish that appeals to young and old alike. Depending on the other items you are serving in that meal, you can select a simple puri or a stuffed one. A puri is apt for everyday meals too. When you are in a hurry, you can quickly make stuffed puris and serve them with curds – everybody will be happy and your job will also be easy! So, go for it – start your puri explorations right away! Enjoy our Puri Recipes, Puris from all across India and other roti, paratha and puri recipe articles below. Khamiri green peas puri is a Rajasthani snack and a rather rich choice for that, since these puris have a scrumptious, semi-spicy green peas stuffing and are deep-fried in ghee. What a wonderful way to eat cauliflower! When combined with peanuts and coconut, cauliflower sheds its unpleasant smell and comes across as a gourmet ingredient. Khus-khus or poppy seeds are used in nearly all cuisines in India. Here is a delicious puri stuffed with a poppy seed mixture and made spicy with the use of Kashmiri red chillies. Other spices such as cardamom, cloves, cinnamon and nigella seeds are also used to add flavoring. Serve these delicious urad dal puris with a sweetish pickle and hot tea on a sunny sunday morning, to recreate a complete rajasthani ambience right in your living room! Simple to make and tasty to eat,kids will enjoy this puri with ketchup for breakfast or after school if served hot!